My posts don’t pop up here on Girls very often, I’m usually found on the pages of Eats, taste-testing recipes so you don’t have to. (And trust me, you would thank me for not subjecting you to the fish and tahini paste disaster, but that’s another story.) Anyway, I was really jazzed to do my first Workout I Did post on Learning 2 Fly, an aerial fitness class. I had been fighting a hip injury (remember all that swimming?) and figured now would be a great time to try an easy-on-the-joints, spine-decompressing aerial workout. I’d witnessed a few performance art acts showcasing the silks, or “tissu” as it is called in the biz, and found it a beautiful combination of strength and grace — a mid-air ballet. The entry level, combination apparatus class looked like a good place to start. 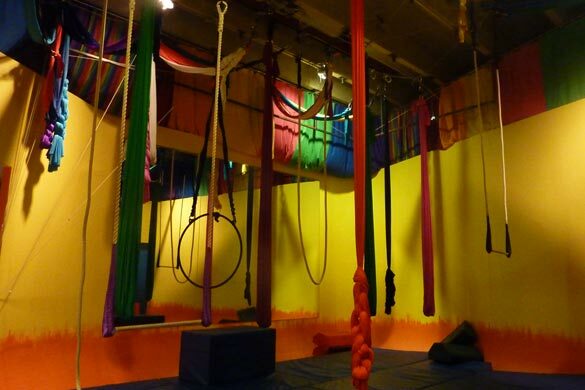 No previous experience was required for the full-body circuit done on silks, slings, a trapeze, the lyra or hoop, corde lisse or rope, the hammock, and something called the cloud swing. Open to all ages, the class is guaranteed to be fun but still challenging. Our instructor, Sumya Anani, deftly demonstrated proper body positioning, handgrip and foot-locks to ensure our safety as we attempted to climb, straddle and invert our bodies. She made it look easy, but then she is a four-time champion world-class boxer. She did emphasize one thing we were absolutely not to do, and that was say the word can’t. The silks required a vice-like grip and upper-body strength equal to the man of steel, but with a little help from my instructor, I managed to move up the length of material. Confidence and sweat oozed from my pores as I made my way to position number two — the giant hoop. The upside-down hanging knee lock proved more difficult, so I cheated and used momentum to get into position. Which normally is acceptable protocol for a beginner — except it started to swing — which is still okay — except I suffer from severe motion sickness, which is definitely not okay! A quick dismount left me woozy and nauseated. I’ve dealt with this my whole life, so I’m pretty use to just sucking it up and moving on — which is exactly what I did. My nausea was getting worse and my attempts became half-hearted. It is pretty hard to concentrate and engage your abs (which is key) when you feel like vomiting. I did manage to try each apparatus one time but finally gave up when I turned pale and clammy. I sat and watched the rest of the class from the sidelines. Everyone was laughing, having a ball and improving on just the second time through the circuit. I, on the other hand, was sucking on a peppermint to try and settle my roiling stomach. It’s tough to recommend something that made me feel like crap, but that is exactly what I’ll do. Bar none, it was the most interesting workout I’d ever tried! Physically demanding, but so distracting you didn’t notice your screaming muscles. For me it’s back to my kitchen and working out on solid ground. I’ve tried an aerial workout once before. You don’t realize how many muscles are working until the following day, which was nice. But I also suffered from feeling nauseated, so it wasn’t my thing, but it was fun.